BOSTON, Massachusetts — When things get tough during the 26.2 miles of the Boston Marathon, Daniel Hincapie, 38, will look to an important sign in the crowd. “Love Wins. Wendy Wins,” a homemade sign reads. Hincapie, along with family and friends, filled a small hotel room in Boston, making signs, playing music and laughing in preparation for Monday’s race. 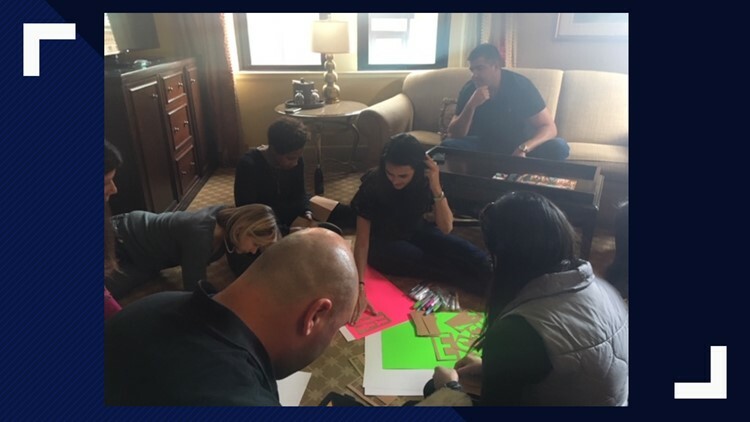 Hincapie, along with family and friends, filled a small hotel room in Boston, making signs, playing music, and laughing in preparation for Monday’s race. “I’m a little nervous but I feel it’s part of the process. But I feel ready," he explained. Hincapie is running the race for his fiance, Wendy Martinez, who was killed during a training run in Logan Circle last year. When you talk to Hincapie about the night Martinez was killed, his eyes relive the moment he knew something was terribly wrong. “I expanded the app on my phone and it showed Wendy’s location in the middle of the street. That’s when I knew,” he said emotionally during an interview in his home Thursday. The 38-year-old looked determined the night before the race---clear about his objective and committed to crossing the finish line. But, before he steps up to the starting line Monday, Hincapie plans to pray for himself, his family and his love —Wendy Martinez. “I’m going to be praying for Wendy, for all of us to stay together—to honor her memory and all of the beautiful things that she taught us,” he said. Hincapie is running partnership with the Wendy Martinez Legacy Project — a newly formed charity to support women through running and technology; important attributes of Martinez. The charity announced Sunday that Girls on the Run DC will be the recipient of their first financial award of $6,000. “Our partnership with GOTR-DC, which will teach girls to tap into their own strength and confidence through the sport [of running], is a fitting tribute to Wendy and a promise that her legacy will endure," said Hincapie. The suspect in Martinez’s death, 23-year-old Anthony Crawford, is set to begin trial in May.